After the Syrian military, backed by the Russian Air Force, completed its operation to liberate the city of Palmyra, RT has been given exclusive access to the ancient city recaptured from Islamic State terrorists. RT’s correspondent, Lizzie Phelan, has captured exclusive images in Syria after 'The Pearl of the Desert' was retaken after an offensive by government troops. Speaking from a hilltop with a panoramic view on Palmyra amid the final push to free the city, Phelan reported on the ongoing battles with the jihadists on the outskirts of the city. Besides capturing footage of the ancient city ruins at a distance, she also noted smoke columns rising from the air strikes at sites where battles were still raging for the airport. “It is being reported that pro-government forces with the support of Russian attack helicopters have now taken control of the entire city of Palmyra. We know that the government soldiers are in fact stationed in the ancient city among those famous ruins,” the RT correspondent said. Part of the footage captured by RT’s crew on the ground shows evening views just outside the ancient citadel which Syrian forces managed to secure after days of intense fighting. The entrance to the ancient ruins is guarded by loyal government troops. Access to the site is still limited as terrorists mined the entire area before their retreat. Senior Syrian officials confirmed on Thursday that they had managed to push the militants out of the city. Earlier, Palmyra's liberation was announced by Russia's Presidential spokesman, citing the Defence Ministry. Government troops entered the archaeological site around mid-day on Thursday as ISIS (IS, formerly ISIS/ISIL) terrorists fled the area, SANA reported. “The flag of the Islamic State terrorist group has been removed from the city of Palmyra. It should be viewed as a joint success of the Russian Air Force and the Syrian military. Shortly, the whole territory of Syria will be liberated from the terrorists,” Andrey Krasov, deputy head of the Russia's parliamentary Committee for Defense, said. Syrian sappers trained by Russian colleagues are again de-mining the city’s ancient ruins almost a year after the initial liberation of the historic cradle of civilization. 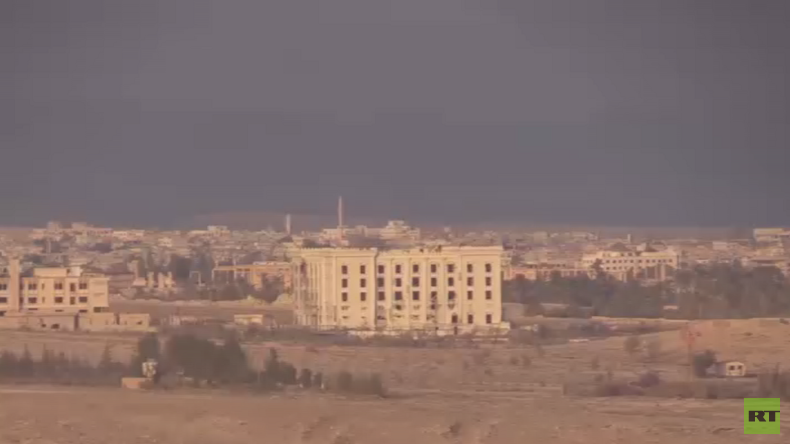 At the same time, fortifications are being erected on the outskirts of Palmyra to prevent any counter-offensive by Islamic State. The city was first liberated from the jihadists last March. However, terrorists, in a surprise offensive, managed to recapture it in December while Syrian forces were busy in the Aleppo war theater. Earlier, drone footage released by Russia's Defense Ministry showed that terrorists have inflicted more damage to the ancient ruins. The facade of Palmyra's Roman-era theater and the adjoining Tetrapylon being destroyed.